Thanks for setting such an interesting challenge this month - I wanted to recreate a classic fairytale scene but didn't have the appropriate stamps to depict Sleeping Beauty, Rapunzel or Snow White! Mum and I share a lovely stamp from Lavinia Stamps which always reminds me of the pumpkin carriage in Cinderella, but Mum beat me to it and she used this one for her entry, so I had to think again. I tried to remember all my favourite fairytales from my childhood - particularly those Tales from the Brothers Grimm and Hans Christian Andersen - but I couldn't think of anything that I could stamp. A little more research was required! I googled "fairy tales" and enjoyed reading a number of tales - and then I found The Gingerbread Man. This might be possible! 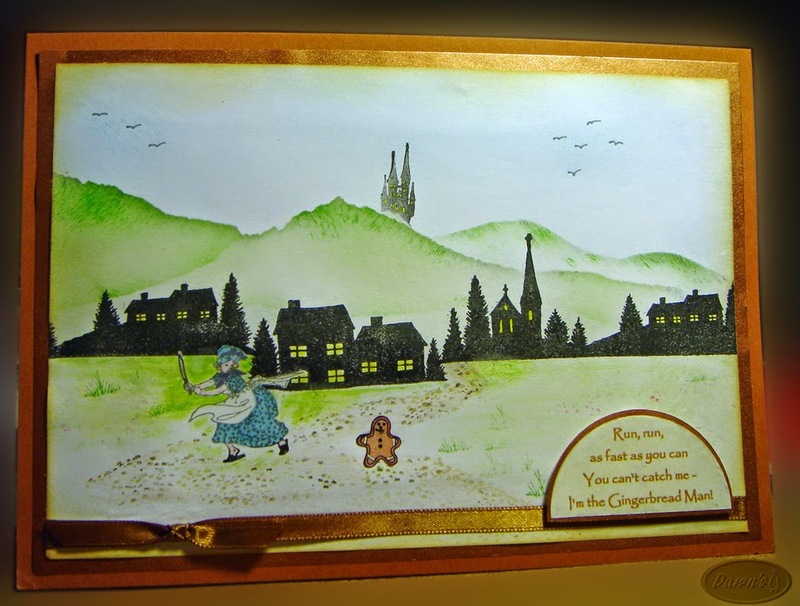 I knew I had a small Gingerbread Man stamp in a Christmas set, and a Nursery Rhyme set from IndigoBlu which could provide the old woman who chases him. I would have liked to have been able to add more characters to my scene, but I don't have any other stamps that would fit, so you must imagine that all the other characters that the Gingerbread Man meets on his travels are just around the corner! haha...you can't use the carriage anymore...your mum have to used it...hihi. you made a beautiful scene as well! and so funny that little Gingerbread Man....with the women behind him...so great!! it tells really the story.